A city-builder with a killer streak. What is it? A deadly survival city builder set on Mars. "A colonist has died," Surviving Mars’ AI assistant warns me in its detached, robotic voice. By the time I’m looking at the dome where she's kicked the bucket, four more colonists have joined her. It quickly becomes a cascade, with people collapsing and gasping for air in every dome. In an alarmingly short space of time, my sprawling colony of hundreds is decimated. Surviving on this inhospitable world is no mean feat, but it's worth the effort. Famine, dehydration, domes cracking and exposing their denizens to the deadly world outside—my first colony ended up being a lesson in the folly of setting up shop on Mars. Over 300 colonists perished. It started comparatively peacefully, however, with cute drones and pressure-free building projects. Humans don't start coming to Mars until they can survive there, so all the infrastructure needs to be established first. By the time the first human set foot on the planet, I had an elaborate life support network pumping oxygen and electricity to everything from domes to drones, as well as lots of ideas about what to tackle next. The list of potential objectives is daunting, but by not forcing you to worry about the needs of the colonists first, Surviving Mars has a forgiving early game. Depending on the bonuses that you get from your chosen mission sponsor, you’ll also get some extra help. The easiest sponsor to pick for your first game is the International Mars Mission, netting you a substantial budget. Money doesn’t mean anything on Mars, but it’s used to buy cargo that can be sent over from Earth, helping out until you become self-sufficient. Ultimately you’re setting up the foundation of your production chain. Despite its survival bent, Surviving Mars still follows the same pattern as Haemimont's Tropico, turning resources into finished products and building whole industries out of them, all while trying to keep everyone happy, or at least placated. It's something familiar to hold onto when the curve balls start flying. Even dust can be dangerous, and Mars is exceedingly dusty. All that dirt loves getting stuck on solar panels, causing power issues and mechanical problems. It’s a low-key but persistent threat that becomes a micromanagement nightmare as you try to make sure that every panel is looked after by drones and every building gets serviced before it inevitably breaks down. Between the dust, meteors and tornados, carving out a life on Mars is a lot of work. Overcoming these disasters and watching as an army of drones fix everything is an incredibly satisfying experience. If you've planned for the worst, kept your stockpiles topped up and put your drones in the right place, you’ll be treated to a mechanical ballet as diligent gatherers scoop up resources and then, in seconds, have everything under control, fixing up machines and repairing drones all over the colony. Even once you’ve got some automation set up, however, it still feels like disaster is nipping at your heels. It's a battle between humans and nature, and for all the fancy tech, it's dogged perseverance that builds successful colonies. It's thrilling rather than exhausting, though. Something is always going on, making sure there's no time for ruts, and most of the the crises feel surmountable with a bit of creative tinkering. If only humans were as great workers as drones. It's not their fault. Mars is an awful place and living there takes its toll, so colonists need their mental well-being looked after. Working during the dark hours, getting sick, seeing someone die—there are so many invisible threats to colonists' mental state, and they can eventually culminate in depression or even suicide. That's why domes need to be filled with infirmaries and social spaces. These places give colonists somewhere to blow off steam and get help, but they also need to be staffed and maintained, necessitating more resources and colonists. That’s the tension at the heart of Surviving Mars: it constantly drives you to expand, whether through resources running out or colonists needing more services, but expansion puts even more demands on your colony. Since these complex colonies can grow to a gargantuan size, Surviving Mars needs a solid UI to make sense of it. Unfortunately, the one it has isn't up to the task. There are quality of life features, like the ability to pin things to a taskbar for quick access, but the menus are messy and there’s a lot missing. It provides a broad overview of the colony, but there need to be more ways to dig into the details. The result is a lot of extra micromanagement, which seems out of place in a game where you command armies of automated helpers and hoard state of the art technology. I actually like that even once you get a pretty advanced colony going you still need to be hands on, but there’s often just too much to juggle at once. 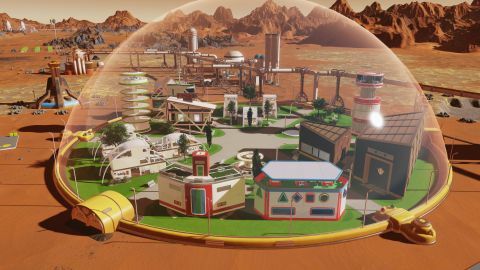 As fiddly and stressful as Surviving Mars can be, nothing else marries survival and city building so deftly. It's a tricky but satisfying space disaster, but I do wish I’d managed to save those 300 colonists.